Add a new recipe to your meal rotation. Get in the habit of making a new recipe every week or every two weeks or once a month. It doesn't matter as long as you try something new from time to time. I tried one this week. This week I made Salisbury Steak for the very first time. I made the onion soup mix and the gravy from scratch so I could skip the chemicals. I used this recipe and if you have been here for long you know I gave it my own spin. I am always tweaking recipes to fit our family tastes and dietary needs. The second one I am doing this weekend is from a post I saw on Facebook. It was a video from BuzzFeed Tasty Videos. A sausage and apple stuffed acorn squash will be made Saturday for dinner. 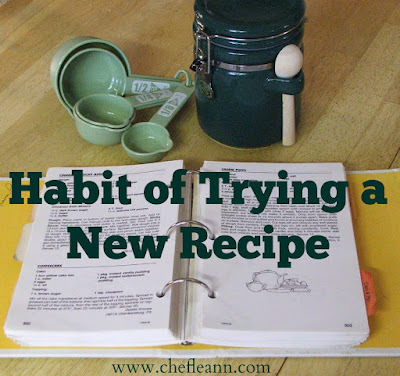 Do you try new recipes from time to time? Do you have a recent new favorite that you have tried that you would share with us? Do you have a favorite cookbook you like to use when finding new recipes? 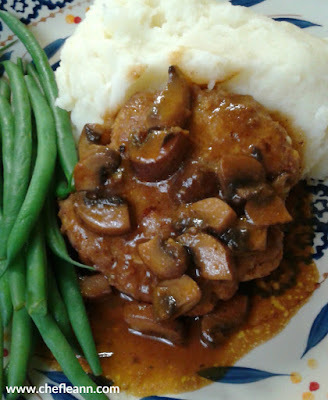 The Salisbury Steak was a recipe I remember eating as a child. Do you have a favorite childhood recipe that you would like to learn to make? Once or twice a month for new recipes, which, given how infrequently I cook these days, is probably 25% of my output. I'm also notorious for serving new dishes to guests - but I also vet those dishes very carefully before I decide to make them. At this point, I can generally tell by reading the recipe whether or not I can make it, and exactly what parts of my skill set are needed. Which cookbook depends on how much time I have to putter, who is going to eat and whether I want to learn a new staple or be adventurous. I love Jacques Pepin's Fast Food My Way - everything is very quick and forgiving, and he offers a bit of his thinking process and substitutions for each recipe. Julia Child's The Way to Cook is one when I want to add a new staple, that can be adapted many ways (and there are parts of it where her commentary is hilarious!). When I'm in the mood to follow a recipe *exactly* and have it turn out perfectly, I use America's Test Kitchen's The Science of Cooking. While I cut my cookbook collection in half a few years ago, it's still pretty substantial. Several Gooseberry Patch cookbooks, all the above in hardcover, the BHG, red plaid book, several picked up on business trips (I generally come back from a trip with either fabric or a cookbook) from South Carolina, New Orleans, KC. I've a pretty fair collection on the kindle as well. So many recipes, and not enough meals to try them all! My grandmother wrote down all her family recipes probably forty-five years ago. My uncle worked for a printer, and had them made into (paper cover) books for everyone. I still treasure mine, though I rarely use it. My grandmother claimed to hate poultry of any sort, having killed/plucked/prepared too many as a kid. So there are NO poultry recipes in her book - and I eat mostly chicken.